At Advanced Dentistry of Collegeville, patients turn to Dr. Nelly Silva to solve a host of complex dental issues and improve their overall quality of life. There was a time in Jennilyn Nevins’ life when severe jaw problems and complex dental issues left her nearly unable to open her mouth. Today she is pain-free, confident, and eager to smile—and not a day passes without realizing she has Nelly Silva, D.M.D., to thank. Nevins went to Dr. Silva’s dental practice, Advanced Dentistry of Collegeville, shortly after she graduated from college in 2007. She had developed significant jaw issues in middle school, and her issues became worse during high school and college. After conducting online research for a dental practice that specializes in temporomandibular joint disorder (also known as TMJ or TMD), and alleviating the intense pain that goes with it, she consulted with three Philadelphia-area dental practices. Ultimately, she chose Dr. Silva. Once the TMJ treatments and her new set of veneers were complete, Nevins was “blown away.” She says she found herself constantly drawn to the mirror, to admire her beautiful smile. Dr. Silva, a native of Nigeria who came to the United States at age eight, wanted to follow in her parents’ footsteps by running her own business. 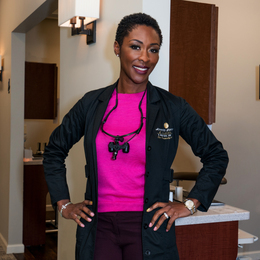 In 2008, after extensive training at Temple University and the Las Vegas Institute for Advanced Dental Studies, she settled on Collegeville as the destination for her practice. As a devoted medical professional with two young children, Dr. Silva finds the challenge of balancing so many responsibilities to be invigorating. Her family-oriented dental practice is always evolving. For example, she is starting a study group to work with oral surgeons and other specialists to help patients with TMJ. She believes working so closely with allied professionals—physical therapists, chiropractors, acupuncturists, and pain management doctors, among others—will benefit her patients. She is proud of how her practice has expanded over the past decade, having grown from a small waiting room and two clinical rooms to a large waiting room with 10 clinical rooms. In addition, her practice has adopted advanced technology and innovative programs, including a dental savings plan and the practice of taking an extensive health history for each patient. Her philosophy revolves around treating each patient comprehensively, meaning she works to understand other medical issues, such as acid reflux and sleep apnea. She finds her work to be extremely gratifying, whether she’s improving a patient’s smile or otherwise having a positive impact on a patient’s overall health, just as she did with Jennilyn Nevins. Nevins advises anyone in need of cosmetic dentistry or treatment for a condition such as TMJ to do their due diligence when choosing a provider.